“Nevaeh” is “heaven” backwards, and the villa’s golf simulator, movie theater, media room, Techno Gym, and fully staffed beach house are just a few of the reasons why this celestial name suits the property. The villa is available for large groups, like wedding parties or multiple families traveling together, and has plenty of space for everyone to find privacy and bliss in this little slice of heaven. Spend your days in the multi-level pool with a waterfall and hot tub, or be pampered with a full range of beachside service on Long Bay Beach. Tennis courts, golfing, basketball, beach volleyball, the choice for entertainment is yours! Nevaeh? Heaven? There’s not much of a difference. Pristine Beachfront Villa! Heaven on earth. Nevaeh is located in the island’s fashionable West End on Long Bay, with wide open ocean views that stretch across the horizon. 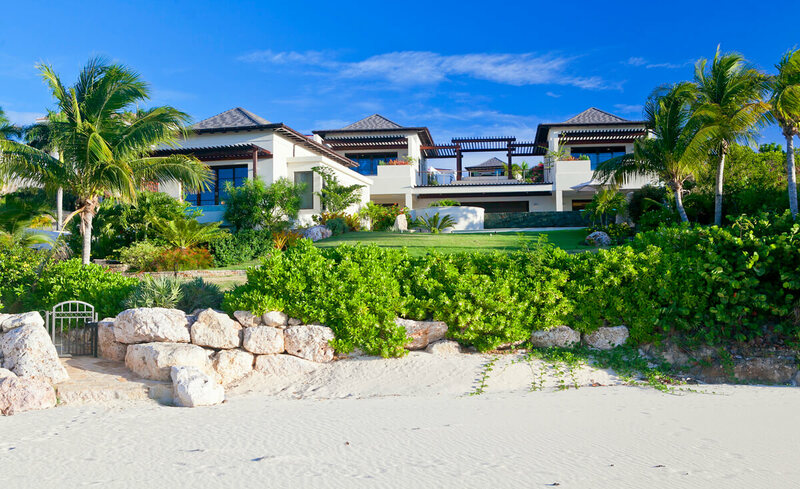 Set in 1.35 acres of landscaped gardens, the villa is steps away from half a mile of white sand and turquoise waters. Guests are greeted by antique Balinese doors, which open to a Japanese courtyard and traditional garden. A generous infinity pool seems to flow into the sea, but actually cascades into a grotto below. There are several places to enjoy a glass of wine or afternoon snack on the spacious deck, whether its stretched out on a lounging chaise or immersed in the hot tub. The outdoor dining area seats 16, perfect for sunset dinners and moonlit cocktail hours. Guests can get active on the lighted Astroturf tennis court that doubles as a basketball court, or test their strength in the air-conditioned Techno gym. Golfers can play on the world’s best courses thanks to a high-tech golf simulator, and athletes can work up a sweat on the beach volleyball court. Sea scooters, stand-up paddleboards, snorkeling equipment, golf carts, a UTV, and kayaks are also available for guests to enjoy. The villa’s interior is just as heavenly. The massive living room sits between the media room and gourmet kitchen, and is furnished for relaxation. The media room is impressively stocked with a 70-inch satellite TV, Blu-Ray, an Xbox console, and a Sonos music system that plays throughout the villa. The kitchen is equipped with multiple refrigerators, an enormous GE SubZero fridge, pro-range stove, farmhouse sink. Six stools run along the granite-topped bar, which is perfectly sized for enjoying a snack after a fun-packed day. The home theater with surround sound makes space for movie nights. Nevaeh is fully staffed with a property manager, villa supervisor, butler, housekeeper, houseman, and on-call concierge. To optimize privacy and relaxation, five of the bedrooms are spread throughout two levels of the main house. Three bedrooms are on the ground level, each with a king beds, an ensuite bathroom with a shower and tub, an outdoor shower, and a TV. One of these bedrooms opens to the terrace, and accommodates guests with impaired mobility. Two master suites reside on the upper level, separated by a pergola-shaded cocktail deck with sea views. Both of these suites have a king bed, an ensuite bathroom with a shower and tub, a TV, and a balcony. One also has an outdoor shower. All five bedrooms have a stackable washer and dryer in the closet, an iPad, and Netflix. The guest house is surrounded by gardens and has its own kitchen, living area, and three bedrooms. Two of the suites share a bathroom and have two queen beds each, ideal for kids. The third suite has a king bed, ocean views, and its own bathroom. One of the suites has a stackable washer and dryer in its closet, and both have an iPad with Netflix. Nevaeh Villa is located 2 miles from the Cuisinart Resort Golf Course, where guests have access to a championship course designed by Greg Norman. Blowing Point Ferry Terminal is 4 miles away, so guests can easily make day trips to nearby islands like St. Maarten. Bedroom 1 - Diamond: Master - First Floor - Features a heated plunge pool on the terrace. This bedroom is handicap accessible. Very large freshwater infinity pool with waterfall with large hot tub. Upon arrival guests will be greeted by a member of the villa management team and transferred to Nevaeh villa. If guests booked the "Classic Rate", after securing their rental car or taxi, they will follow the greeter to the villa. The taxi is at guest expense. Nevaeh provides two 6-seater golf carts and a 4-seater UTV. The "Heavenly Rate" offers a hot breakfast, full time chef for lunch and dinner (villa pre-stocking is included, cost of food is additional), beverages including soft drinks, beer, house wines & liquor (some top shelf liquors), one transfer to and from your Anguilla port of arrival, free international calls to USA, Canada and UK, personal laundry, butler, wi-fi, Netflix, meet-and-greet, and welcome refreshments. "Classic Rates" (non-inclusive) are available, please ask your villa expert for those rates. The Classic rates includes welcome refreshments, grocery prestocking, a starter pack of food/beverage items (soft drinks, beer, snacks, etc. ), and free international calls to USA, Canada and UK. Our stay at Nevaeh Villa in Anguilla was amazing. The villa was lovely, inviting, and set on one of the most beautiful beaches. Waking up everyday and having that amazing view was a once-in-a-lifetime experience. From the minute we arrived and were greeted by the amazing staff, we knew we made the best decision to stay at Nevaeh. The staff were great, very courteous and friendly, and made our stay so comfortable. There wasn’t anything the staff didn’t and wouldn’t do for us to make our stay incredible. Great facilities and staff. Excellent experience. The facilities at Nevaeh Villa were great. Our group spanned 3 generations, with 18 total guests, and all were well-housed and accommodated. The rooms and amenities were above par. The deep, sandy, wide beach had easy surf access and no rocks or coral underfoot. The pool overlooking the beach had a shallow area for small kids and an adjacent “jumping pool” for older kids. Villa management from Kenroy was very professional and gracious. All the logistics were perfect. The performance from on-site villa staff Winston, Claudia, and their team was superb. The chef services from Sherman proved excellent as well— because of our group size, we ate most of our meals on premises. Shawna was excellent, helpful, and responsive. We had no issues or reservations whatsoever during our booking experience. Thanks, Shawna! We visited Anguilla April 23-28, 2018 and had the pleasure of staying at Nevaeh. Oh my word, it was nothing short of amazing! Every detail was thought of and taken care of! The private beach and the house itself were serene, and Winston, Claudia and the other staff made our stay even more delightful! They were knowledgeable about the island and where to go, along with being available whenever we needed. We can’t wait to go back! This place really does live up to it’s name! Sharon was so helpful to work with on booking this vacation! I had lots of questions and she was able to answer personally because she had just been to the house. Hurricane Irma hit after we had booked our trip, but Sharon was diligent on keeping us informed on the property and local happenings. Wow! What a home! Of all the villas that we have stayed at, this one is by far the best. Perfect for kids because of the pool and the beach. The construction of the villa enables you to be outdoors and still in the shade if you want. The villa is open and there is always a breeze. Really magnificent. We occupied 4 rooms and all the rooms can be quiet and dark if you like to sleep in. The staff are all exceptional - serving up breakfast, keeping our rooms tidy, and recommending day trips. Renting a car/van is a good idea because the golf carts have limited range. I recommend that you have a lot of dinners at home especially if you have little ones with you. After a long day, the kids are wiped out and service at some restaurants can be slow - “Island time”. Best Buy supermarket is a few minutes away and you can stock up the kitchen yourself. Everything is top quality, top materials in the villa including the tennis court and the basketball. Thank you so much Shawna. You have the best web site for searching villas with the map and the photos. Shawna lined up all the dinner reservations for us before we arrived. Shawna arranged our rental van and the van was in the driveway when we got there. Shawna arranged the private boat transfer from St Maarten to Anguilla. We felt like VIP. Everything was so smooth from start to finish. How about giving your Mom a Mother’s Day gift that will go down in history as the best gift ever? Take her to Anguilla for a 5-night stay at luxurious Nevaeh villa, on beautiful Long Bay Beach. Celebrate her special day in a stunning setting while being pampered by the villa staff which includes a chef and butler. Mom will receive a complimentary 60 minute massage, a bouquet of flowers, and a gift basket with champagne, gourmet snacks and sweet treats. Good for stays from Mar 23, 2019 to May 30, 2019. Nevaeh Villa offers guests the choice of a non inclusive rate certain times during the year. Good for stays from Nov 18, 2018 to Dec 17, 2019.